The UV filter is simply a clear filter placed on the front of a lens that is used to protect the lens from being damaged. 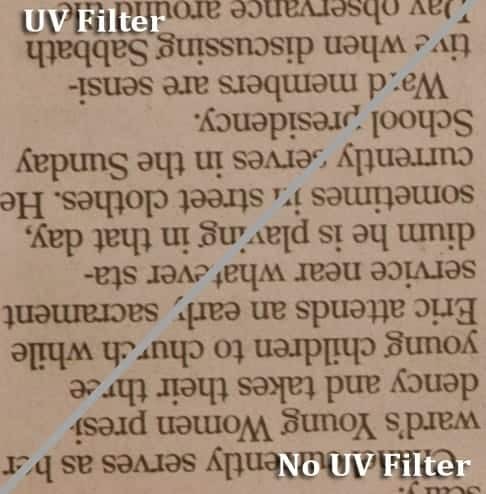 Filter manufacturers make wild claims about how UV filters cut through haze, but that has been proven false long ago. Some photographers use UV filters because they cost much less than a new lens, so if the filter gets scratched, it can simply be replaced for a few dollars instead of necessitating the purchase of a new lens. While it actually is not very expensive to replace the front element of a lens if a scratch occurs, most photographers still like the extra insurance of a UV filter on the lens. Still, professional photographers usually stay away from UV filters because they fear that UV filters will reduce the sharpness of the lens and cause more lens flare. I have personally been of the opinion that UV filters negatively impact image quality. Therefore, I have never owned a UV filter, much less put one on my lenses. However, I wanted to test this theory to see just how much damage a UV filter actually does to image quality. To start my test, I had to purchase a UV filter. I didn't even own one because I was always afraid that they would negatively impact the quality of my images. I didn't just buy any UV filter. I bought the cheapest junkiest one I could find. I figured that if this junky filter didn't degrade the quality, then any UV filter would be fine. But one UV filter wasn't enough. Dustin Olsen, who now works with me on Improve Photography, also tested the belief with his UV filter using a different camera and different lens. 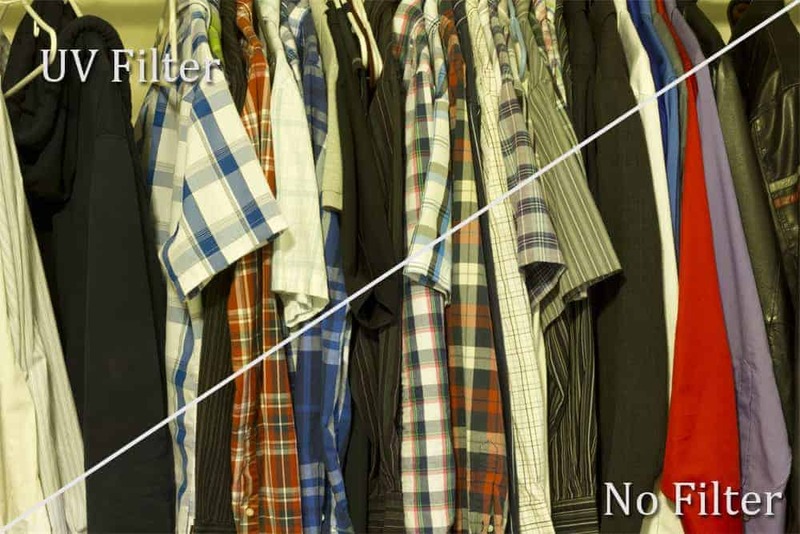 I do not see any difference in sharpness in the photo taken with the UV filter and the photo without the filter. The first part of the testing was to determine if the UV filter negatively impacts the sharpness of the image. My preferred way to test sharpness is to tape a newspaper to the wall and then take pictures of the newspaper with a camera locked down on a tripod. The small lettering on the newspaper makes it easy to analyze the sharpness of the picture. As you can see from the photo, I could not replicate any reduction in sharpness from using a UV filter on my lens. In terms of sharpness, I could not see any difference at all in the amount of sharpness. To ensure that I was not doing anything to impact the test, I put the camera on a sturdy tripod, used mirror lock-up, and wirelessly fire the camera so that my pressing the shutter button would not bump the camera and impact the sharpness. Do you notice the very slight color cast on the white portions of the image taken with the UV filter? Click to enlarge. The next step was to check for a color cast. In my testing of the Zeikos filter, I was only able to see a very tiny color shift that was almost imperceptible. I tried shooting subjects with various shades of white (using manual white balance of course) to see if I could find any color shift, and any color cast I found was so slight that it could be only in my head. On the other hand, Dustin's test with a different brand of UV filter showed a fairly significant color cast. The photos that he shot with the UV filter showed a noticeable yellow/brown color cast when compared with the photos in which no UV filter was used. This test was extremely difficult to perform and I actually found it impossible to come to a firm conclusion on the subject. The problem with the test is that filters necessarily sit about half an inch in front of the front element of the lens. When I placed the camera on a tripod and then angled the camera away from a light source to see if there would be lens flare, I was unable to duplicate the effect of the shot with the UV filter because I had to move the camera in order to get the UV filter in the same position as the filter-less test. Also, the front element of the lens sits further behind the shell of the lens, so some of the light that would otherwise touch it is blocked by the black sides of the lens. This makes it seem like the front element has less lens flare when the fact is that some of the light is simply being blocked by the side of the lens since the front element is slightly recessed. Having said that, it did seem to me that using the UV filter did in fact cause more lens flare than the photos taken without the UV filter on the lens. While this evidence is more anecdotal than scientific, my results seem to comport with the experience of many other photographers. When I tested the UV filter compared to no UV filter, I noticed a slight increase in the amount of lens flare, but this was impossible to test scientifically. My test confirmed that UV filters definitely have a negative impact on image quality; however, I was surprised that the UV filters only caused very minor changes to the image. The sharpness was not affected at all and the UV filter only made a tiny change to the color and lens flare. 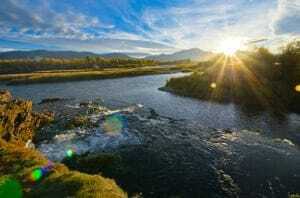 The bottom line, in my opinion, is that UV filters should be avoided where possible, but it really shouldn't be something for photographers to panic about. 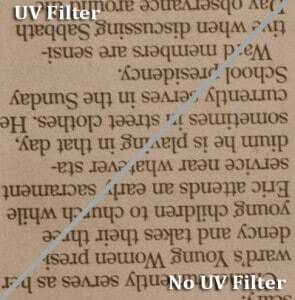 Even the junkiest UV filters cause only a slight change in the image. Also, UV filters can be handy when shooting in rough situations. A UV filter can be useful when shooting near the ocean or at a waterfall where sea spray and water can get on your lens. If you shoot in these situations with a UV filter, you could remove the filter half way through the shoot and have a clean lens without stopping to clean the lens. The same would hold true for shooting in very dirty or dusty environments.